I love the movie "High Anxiety". There are some great lines as the Bellman takes the acrophobic Psychiatrist to the top floor, saying "We are going to the top floor, all the way up, you can't get any higher, we're pretty high." That amuses me. We have the top of the line rosewood Taylor, a 914 CE. The only way to go higher in the standard Taylor production is to get a Presentation series model. The 900 series is top of the line for Taylor Indian Rosewood models. Our Taylor 914 CE is from 2016, and it is super nice. This is a near-mint example out of a collectors stash. The only blemish we can see is an impression in the top near the edge of the waist on the treble side. This guitar has beautiful Indian Rosewood with Taylor's V-Class bracing, a beveled armrest, ebony binding, Gotoh 510 tuners, and label signed by the designer. 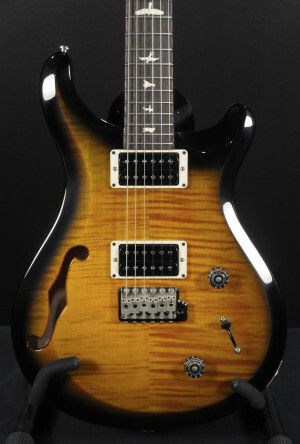 It is a wonderful guitar, plays great, sounds great, and looks great. It is perfect and a joy to play. Comes with original hard case.